Biochemists managed to isolate in the structure of the fungus a high concentration of phytoncides that help to cope with any viruses and even successfully resist the AIDS virus. The fungus stimulates the production in the human body of remarkable cells - lymphocytes and proteins of perforin, which are effective killers of atypical, malignant, cancer cells. It is used in such types of malignant neoplasms, such as: leukemia, sarcoma, melanoma, and a number of others. - Healing of various ulcers, wounds. 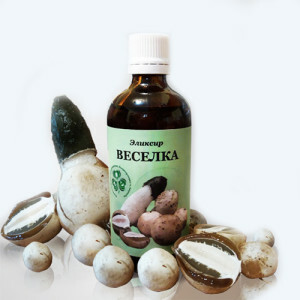 The second direction, which uses a mushroom veselka - the prevention of various diseases. For the fungus Veselka recipes differ in their variety, so before using it is necessary to consult a fungotherapist. The fungus also has contraindications: for expectant mothers and nursing mothers, children up to 12 years.